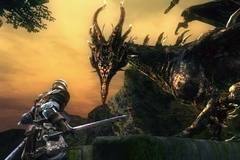 Kalameet was the last of the ancient dragons and had a single orange eye. It was called "bringer of calamity". 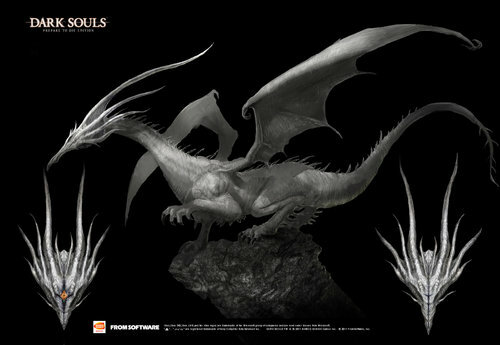 The title of this theory is a little misleading because it is clear that Manus is what brought about the true destruction of Oolacile, but it can be theorized that Kalameet started it all. Kalameet's presence provides an explanation as to why the people of Oolacile began to look for more power, why they were susceptible to the promises of a toothy serpent. The people of Oolacile lived an idyllic life, they had established guardians to protect them from danger and gardeners to provide them with daily essentials to survive, but when the Black Dragon Kalameet, a dragon whose ire not even Anor Londo would provoke, decided to make Oolacile its new home, the people of Oolacile realized that their defenses would not be enough. While Kalameet may not have actively destroyed the township of Oolacile, it is likely that it terrorized its citizens in one way or another. Prompted by their dire circumstance, the people of Oolacile began to search for a new means of power. This was a town that lived in the shadow of Anor Londo, one that followed the ways of Gwyn and had nary a murmur of dark. It was then that a toothy serpent appeared to these desperate people, and told them about the ancient being that dwelt within the ground. Should they unearth it, they may find the power necessary to defeat the dragon that plagued them. And so the people listened, they followed the advice of this toothy serpent, and the rest is history.